I was soo excited when I opened up my September Gossamer Blue kit last month and saw the exclusive papers. I knew right away which photos I wanted to scrap because one of the papers matched my daughter's outfit so perfectly. Well, actually the patterns were identical but the colors clashed but I quickly printed this photo out in black & white and my problem was solved. Check out this layout and you'll see why my jaw dropped. How cool is that? I wanted to use this paper all up and I did on another layout, which I'll reveal here and on the Gossamer Blue blog soon so you'll just have to wait and see. It'll be a fun post though because I actually changed the color of my daughter's shirt. That's another day soon though. If you know me, you might expect a few layers, some splattered mist and stitching. The journaling is hidden on the little white card with the blue enamel dot. These girls of mine are my EVERYTHING. I am so honored to be their mommy, through the triumphs, tribulations and struggles. They are the first thing I think of at night and when I wake up. Okay, enough of the sappy mommy stuff. Let's look at one more thing I love about this layout. I am proud of my labor of love stitching. I machine stitched each heart and it took a while with lots of twists and turns but it just looked so bare as a border without it. I hope you'll visit us over on the Gossamer Blue gallery or say hi in the community. Until then, thanks for stopping by. Now go on a get crafty! 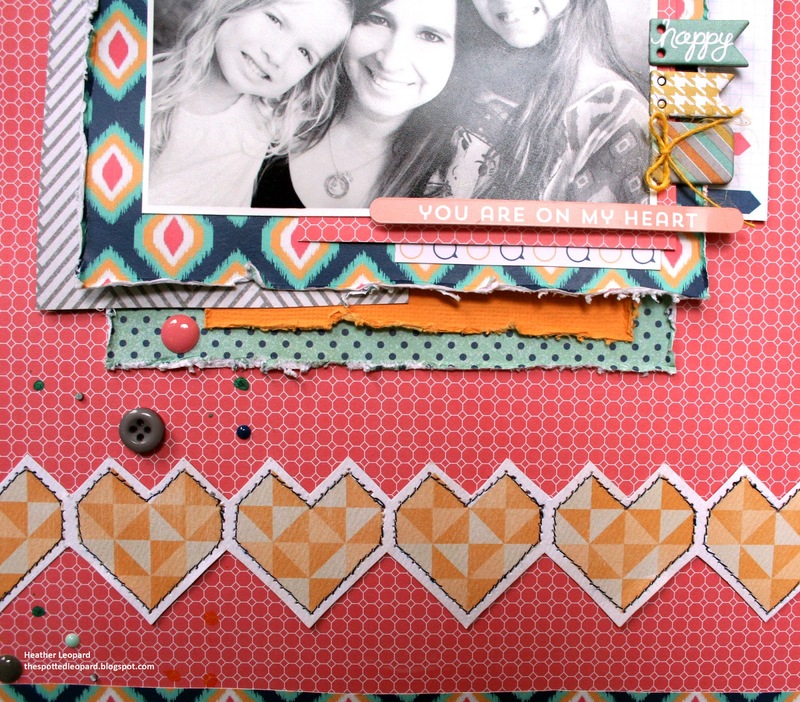 Love the layers and the heart border you created! Great page, love the mix of pps. Love the distressed edges and the layering! Gives so much dimension! Really cute layout! I love all the papers you used together! love all the color, full of joy! love it! 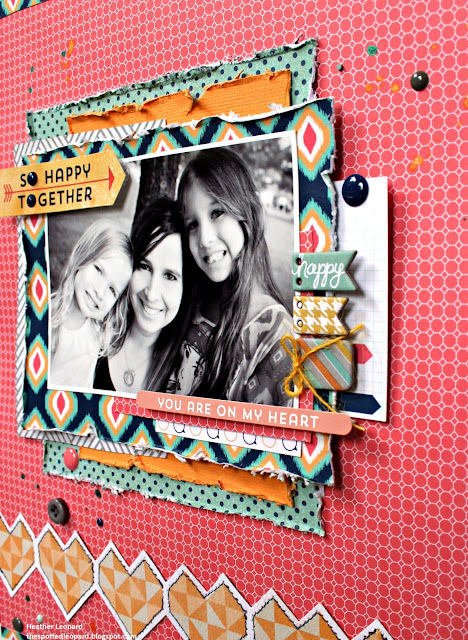 I love this mix of papers together! And fabulous stitching! What a great photo! 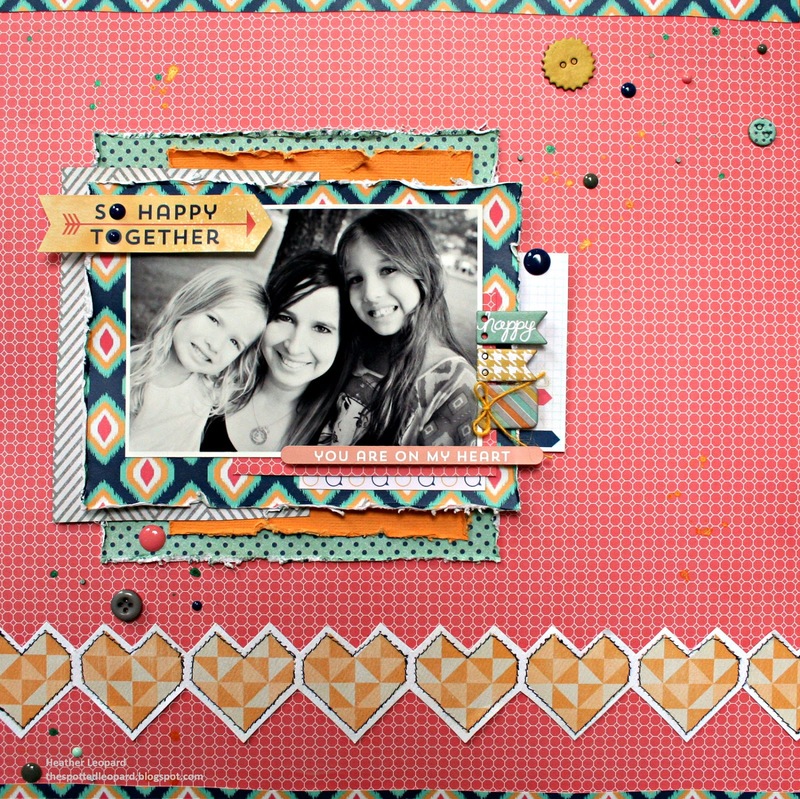 Love the ikat paper too - so pretty! This is absolutely fabulous Heather!! The stitched hearts look amazing!! Heather this layout is just GORGEOUS and the stitching is SO Fun--WONDERFUL job!! What a beautiful page! I love this colors! Adorable page Heather!! Love how you stitched around those hearts! !